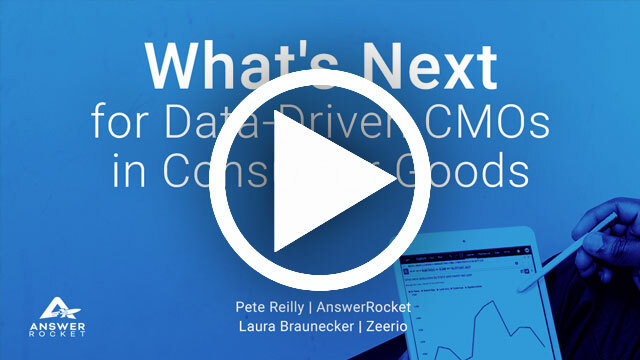 In our webinar, “What’s Next for Data-Driven CMOs in Consumer Goods,” our Pete Reilly sat down with CPG marketing strategy expert Laura Braunecker to discuss the future of CPGs. While at Kimberly-Clark, Newell Rubbermaid, and Georgia-Pacific, Laura held leadership roles in marketing strategy, research and insights, and brand development. So she knows what marketing executives within consumer packaged goods are focused on. Laura shared the many external challenges CPGs are experiencing – the rise of private labels and start-ups, omni-channel competition, and shifts in the retailer relationships. But she felt that internal challenges were just as pressing. After attending this year’s Gartner Data & Analytics Summit, Laura saw augmented analytics as a way for CMOs to gain an edge. It made her think of a shift she had witnessed earlier in her career. “In CPG, when I first started we had entire departments called competitive intelligence. ‘Hey, go look at this new category. Should we be concerned? What’s going on with it?’,” Laura said. “All of the sudden, Google comes along and I haven’t had a competitive intelligence group in a really long time because my product managers, my category managers, my research managers, they could all do competitive intelligence and they could do it in a few hours. For Laura, she saw next-generation, AI-powered solutions as having the potential to transform marketing teams.